The school program attracts pupils and students to science, while educating the wider population about climate, innovation and sustainability. In 2009, Sønderborg Municipality, the Universe Park and ProjectZero created the learning initiative House of Science. Since then, the local utility company (Sønderborg Forsyning), youth education programmes and the University of Southern Denmark have joined the partnership. The project demonstrates close cooperation with all local actors and is rooted in local communities, with citizens also able to participate in House of Science activities. Aligned with Sønderborg Municipality’s education strategy focusing on lifelong learning, through the motto “from ABC to PhD”, House of Science delivers educational courses and materials, developed in collaboration with teachers and students under the topics “Climate, Innovation and Sustainability”. The UN Sustainable Development Goals are integrated into the teachings, which include courses such as Green Generation – Clean Water and Girls’ Day in Science, which focuses specifically on providing science education for girls and encouraging them to consider higher education in science. Through the House of Science curriculum, children and young people are motivated and excited with the latest scientific knowledge. The initiative also involves local businesses to demonstrate the importance of science in society and sustainable development. In 2016, Sønderborg was the sole Danish municipality to join UNESCO Sustainable Learning Cities for its work on lifelong learning, education and sustainability. The aim of The Green Curriculum (Den Grønne Læseplan) developed by House of Science, is to provide children and young people with knowledge and skills to create sustainable futures. During Girls’ Day in Science, 100 7th grade girls collaborated with 15 young female role models on an innovation task aimed at changing the girls' opinions on engineering. 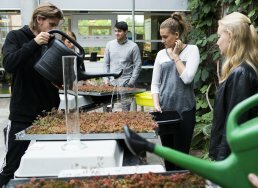 Through school programmes, House of Science prepares students to participate in Sønderborg Municipality’s ambition of achieving 100% CO2 neutrality by the year 2029. Sønderborg Municipality, is a municipality in southern Denmark located partially on the Jutland peninsula and partially on the island of Als.